If you're on a Lite or Pro subscription, you will need to let us know which reports you would like access to over the course of your subscription. Simply find a company and click Unlock Report at the top of the page. 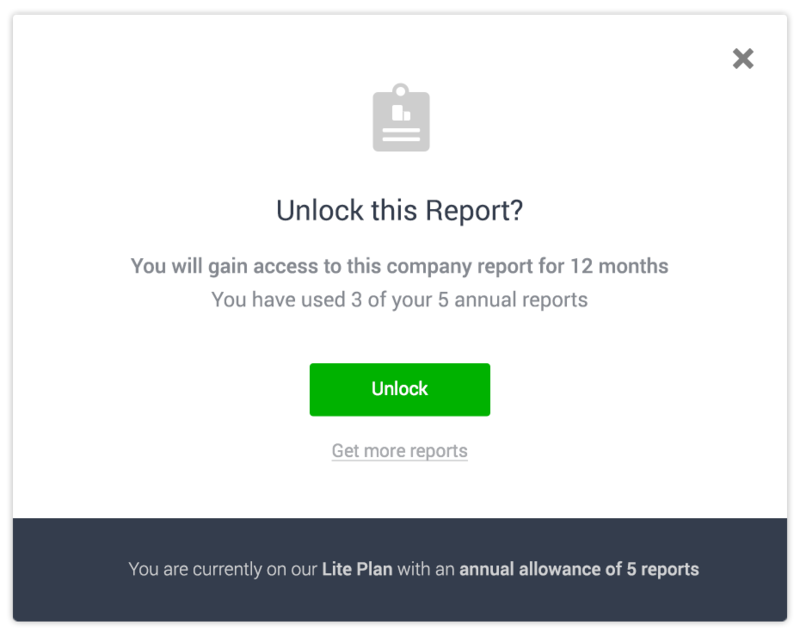 Confirming the reports you wish to unlock ensures you can view as many companies as you need for free, without these views counting towards your annual quota. You can review your remaining balance in your account. Need unlimited access to Credit Reports? Consider our Enterprise plan which includes unlimited access to company and director reports. This means for a fixed annual fee, we'll automatically 'unlock' all credit reports. Upgrade today and we'll refund you for any time left on your existing plan (make sure you're logged in). If you are already on an Enterprise plan or you signed up before Sep 2015 all reports are automatically unlocked by default.